I remember just a little while ago when they were nothing… just a collection of bits and pieces. They were there, really, all along, just not assembled. Then, I took out the thread, the joiner, the welder, and I started to wrap this in and then that. Each part has a purpose. Each part has a role to play. Some for flash, some for structure. Wraps and more wraps and snips and cuts. Imagination. Picturing where they will be, how they will behave while they are out there, in the world, fulfilling their purpose. These are going off to the Bahamas in someone else’s box for someone else’s bonefish, but I’m glad to play a part, to be part creator, to set my children free in the world to fulfill their destiny. This entry was posted on Wednesday, June 12th, 2013 at 2:37 am	and is filed under Flies. You can follow any comments to this entry through the RSS 2.0 feed. You can leave a comment, or trackback from your own site. I enjoy tying flies for others. The only payment I want is to hear or read the stories of how and where the flies were used. Did they catch fish? Did the flies work great? Did they have a great time using them? I want to know these things. 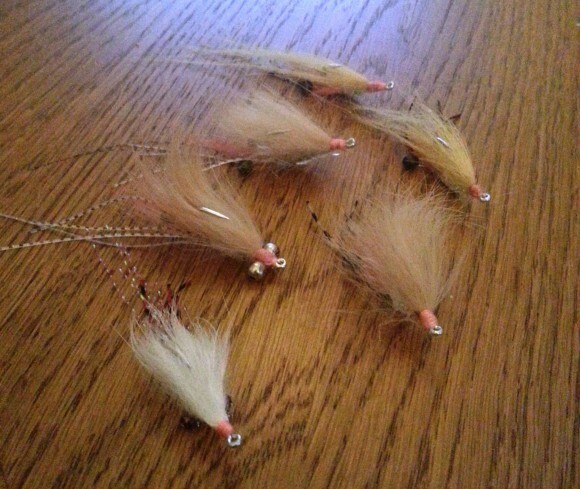 Tying flies is an interesting paradox. On the one hand, one can and often does invest some serious money and time in the hobby. For many that time is more precious than the money, but both are not undearly parted with. Hooks are getting pricier every year and those genetically grown feathers… Some (including me) spend some time studying and researching the prey we’re trying to imitate. Then we experiment with materials and methods of attaching those materials and with weighting the flies to produce something that closely resembles the prey. And when one does come up with something successful, especially if it’s different than anything else you’ve seen, a sense of pride and selfish accomplishment sneaks into your psyche. So considering the investment, it’s easy to become attached to the flies. the attachment can become so powerful it makes one reluctant to toss them into a particularly gnarly lay, or give them to friends, and sometimes to even use them at all. On the other hand, flies are expendable commodities. Fish chew them up; bushes, trees, mangroves and coral heads steal them (as well as the fishing buddy with a nefarious streak who loves to sneak into your fly box when you’re digging in the Yeti for a beer). They make good gambling chips when the dominoes or playing cards come out in the evening. And like Mark said, a feeling of camaraderie and helpful benefactor is gained when you tie a few for a buddy to try. Or you meet another fly fisher who seems to be struggling and you set him or her up with a couple of flies that are working great for you. So becoming attached to flies is not a good thing. Personally I think a little of both attitudes are best. If you get too cavalier about the flies you tie you stop putting in the effort to try new things, to think about the prey, and to tie a quality fly that will last beyond a couple whip snap casts on a windy day. And you cannot become so attached that you hesitate to cast it into that shadowy 18 inch wide gap in the overhanging mangroves that big snook just slid into. Like many things in life, balance is important. I do love tying and creating, but I don’t have the thing were I don’t want to use the flies. I really only want to use those flies and I want to use my best flies and I’m upset when I don’t have enough of them. The flies I don’t like tend to stick around in my boxes for a long, long time… until the rust and I throw them away. Thanks. Tie those worms for next year. Actually, neeeeed another fix, and tickets to MIA are only $450 (yikes) so I’m heading back next week to try again. Not sure if I can convince any of the buddies to tarpon fish with me, but I’m not above staking out on my own and tossing at the few that swim by. There are certainly worse ways to pass a day. Good luck with those stripers, BTW. Man… wish I could join you. The Stripers weren’t in, but I did find some pretty water.